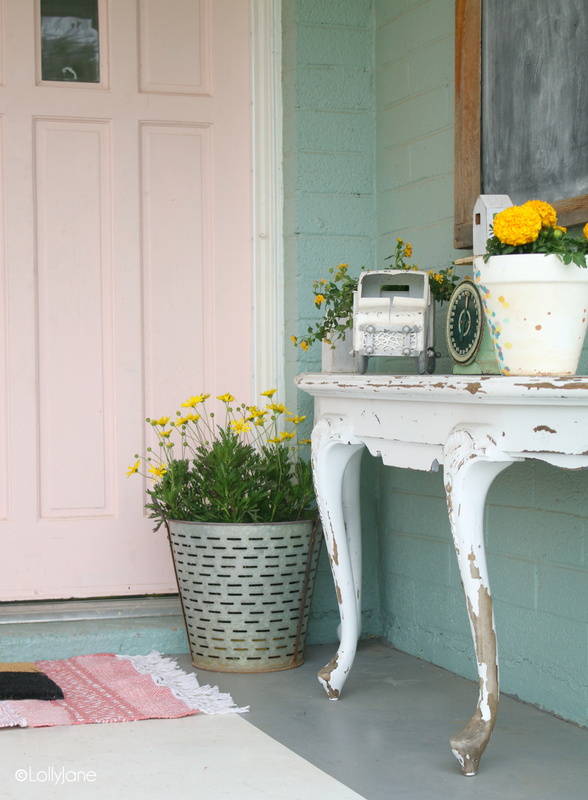 refresh your front porch for spring by adding these simple touches that welcome the season of florals + sunshine and say goodbye to winter forever! After you’ve layered rugs, top it with a watering can. 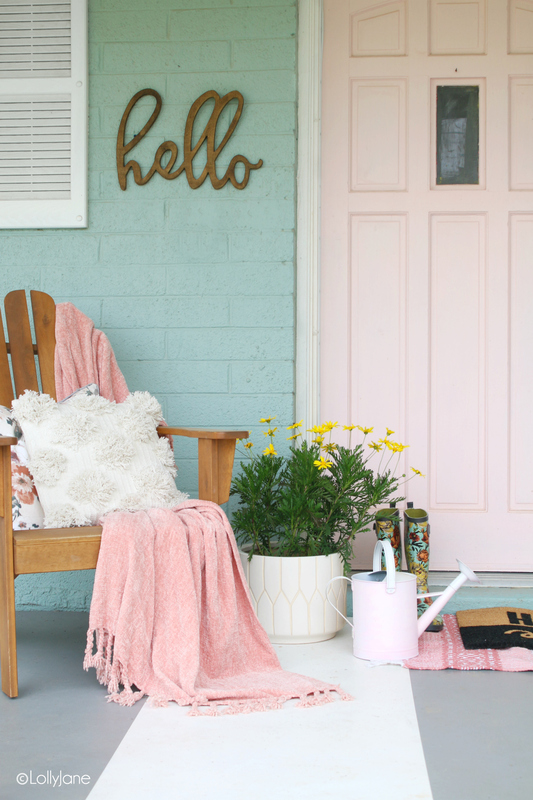 We DIY’d ours pink but you can buy them retail or find them thrifted… check the outdoor section of your local thrift store and you’re sure to find one. The uglier the better as spray paint will be your bestie to easily transform that cutie! Who doesn’t have a pair of rain boots? 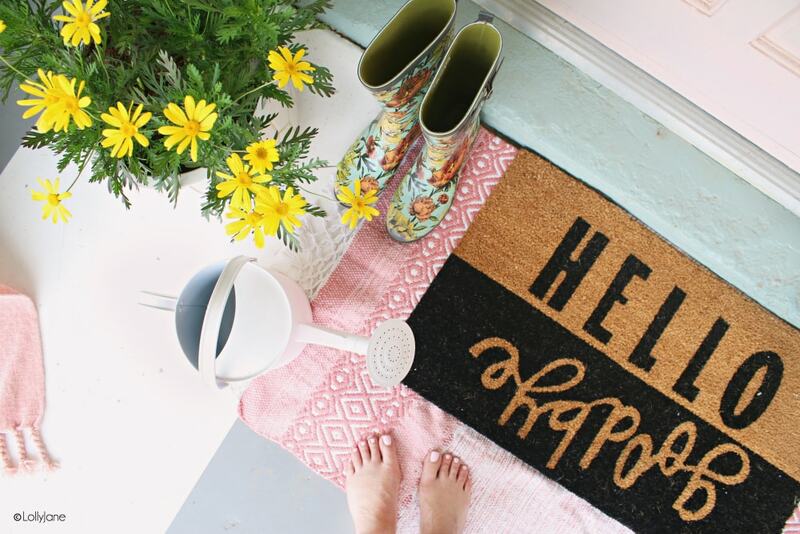 Not only are they practical this time of year, but they’re sitting next to the door anyway so simply leave them there and pile with a watering can over your newly layered rugs. Lastly, flowers = SPRING! It’s a fact! 😉 Simply re-pot it in one you have on hand or paint a large terracotta pot in your favorite hue! Other ideas are wall signs (like our hello cutout, picture below,) statues of bunnies or eggs, wreaths to go on you front door(s) or even a bike propped by the door with a basket of faux or real flowers inside of it! We love how texture can instantly cozy up a space so try adding a chair near the door and toss a blanket over the top of it and finish off with your favorite throw pillows. Bam: a warm welcome for your guests to get comfortable and stay: check! Yellow, pink, and aqua blue are my favorite combinations of color in the history of ever so naturally I was drawn to these inexpensive marigolds while on a Home Depot run this week. I love the pop of cheery yellow against the pink + blues! 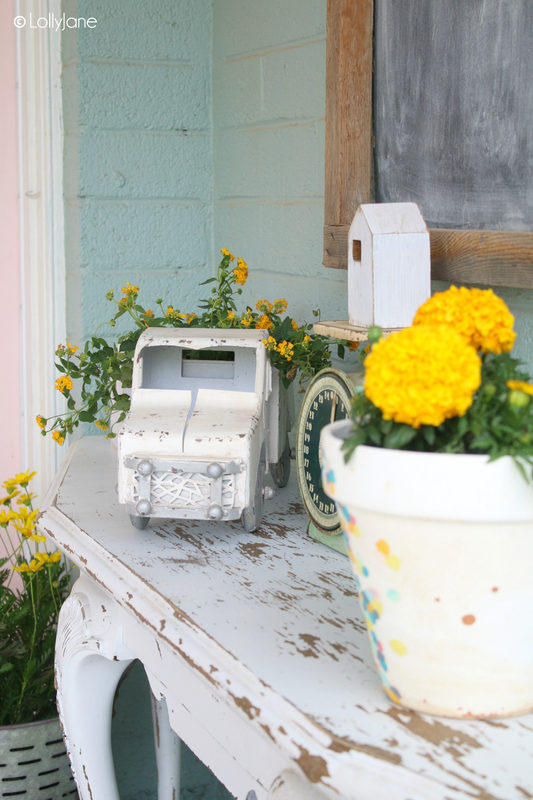 As you can see, the truck below is NOT a planter… but how cute are those florals in the flower bed, (I mean, bed!) of his truck? Answer: super cute! 😉 I simply potted them over a small tray and voila! I don’t expect them to last as long as the other plants that are rooted in the earth but this would certainly make for a cute centerpiece for a brunch. I vote to plant ALL the things so use what you have on hand: olive buckets, pails, crocks watering can, handmade pot from your 9-year old, etc.! 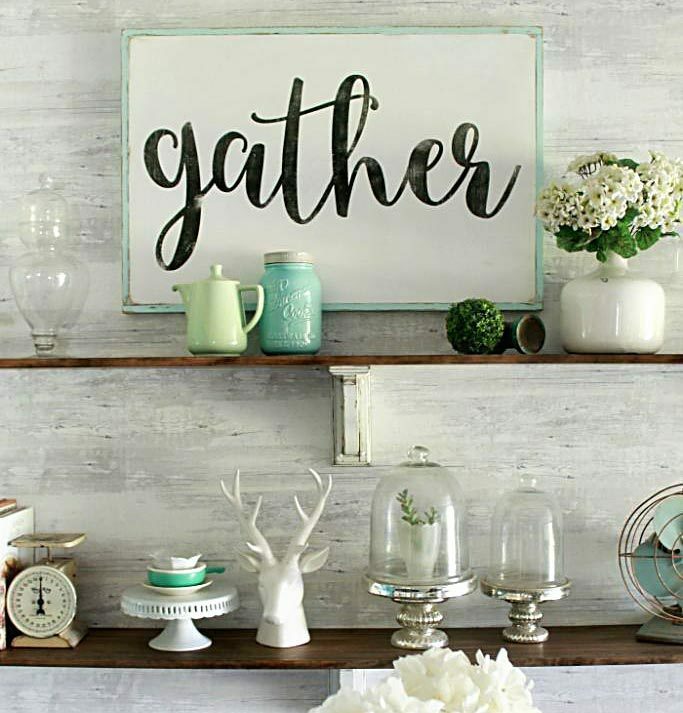 Even MORE Spring Decorating Ideas! 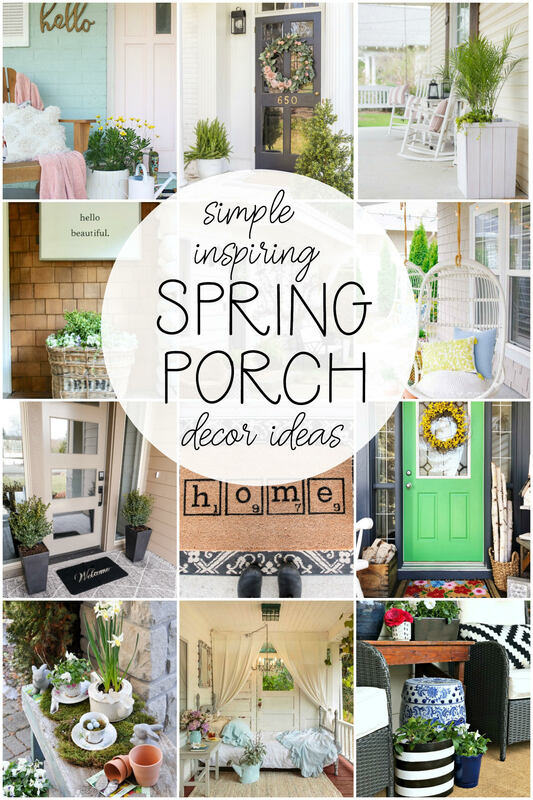 Take a peek at these fabulous Spring Porches as part of the Seasonal Simplicity Spring Series! Super pretty refresh and updates! I love the cheery springy colour scheme! So so cute!! 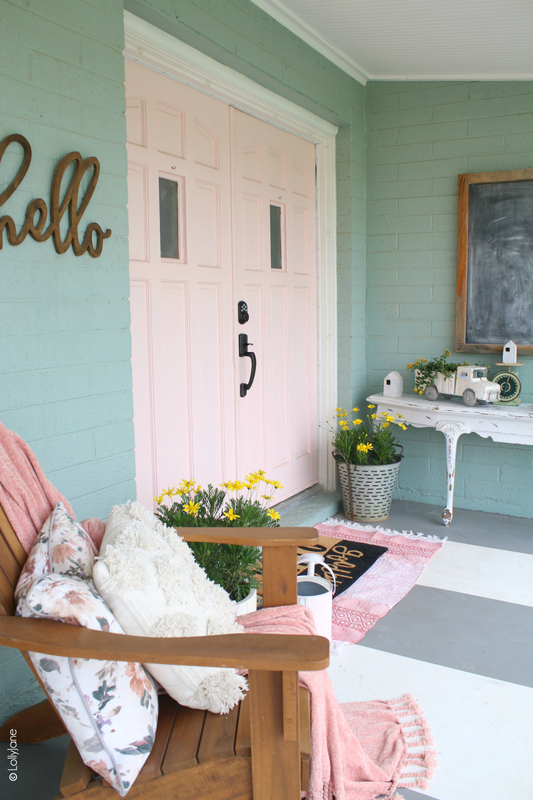 I love the pop of pink, perfect for Spring! Love it! Perfect for spring! 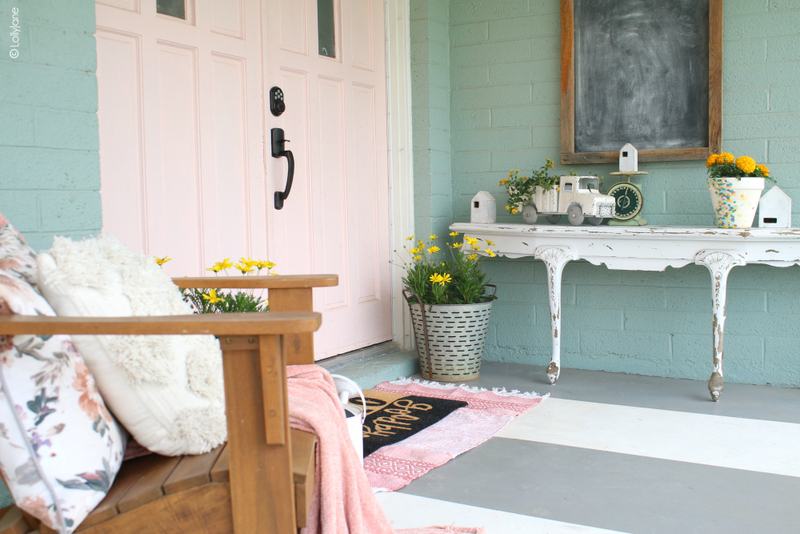 this tips for this spring porch refresh perfect and i liked. and so so cute!! perfect for spring…!